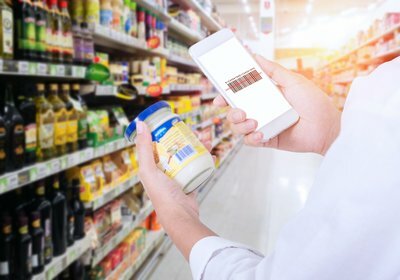 The Monash FODMAP Diet App contains the world's largest FODMAP food database, allowing you to quickly find FODMAP information for over 800 foods and counting! 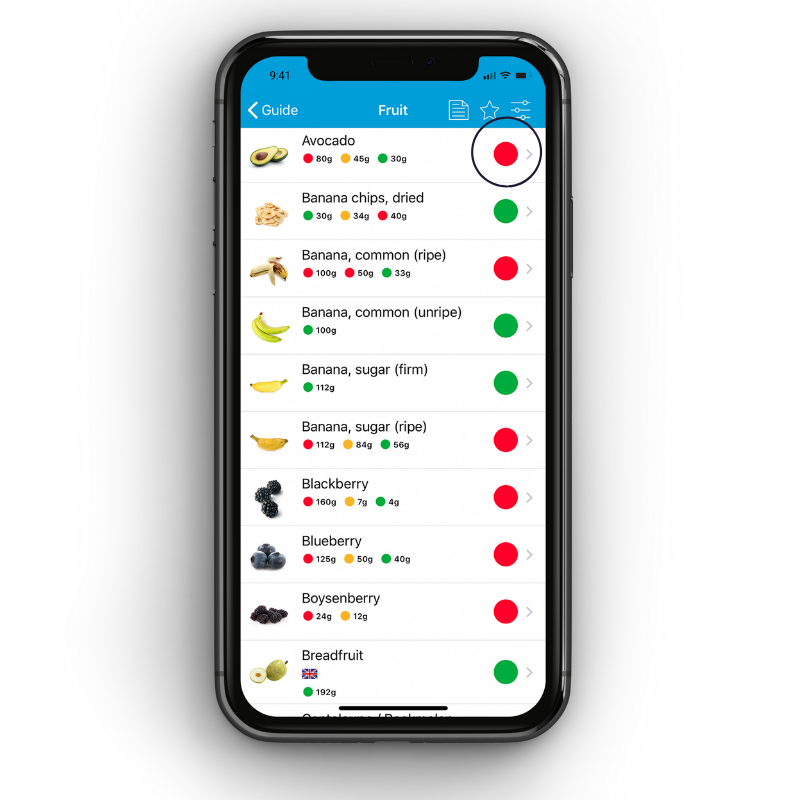 The app uses a simple traffic light system to help you identify which foods are high, moderate or low in FODMAPs and also provides you with detailed information about which FODMAP(s) a food contains. The most important thing to remember when it comes to FODMAPs is that serving size matters! In fact, some foods can be either high, moderate or low in FODMAPs, depending on how much you eat at a time. All serving size information provided in the app is on a per meal basis. 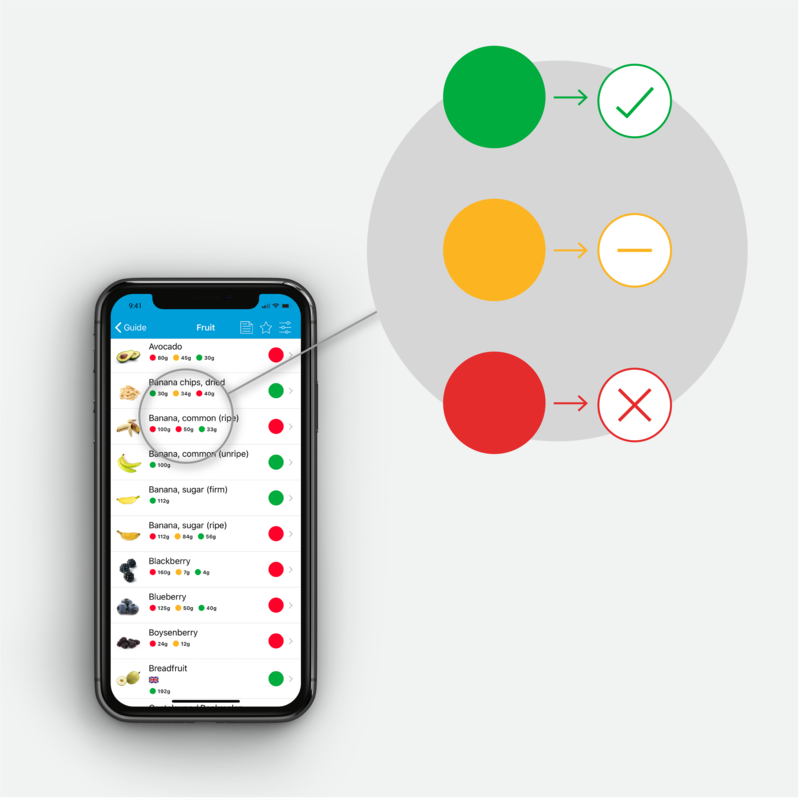 In the app, you will see two sets of traffic lights visible for each food when you click into a food category (for example, fruit). 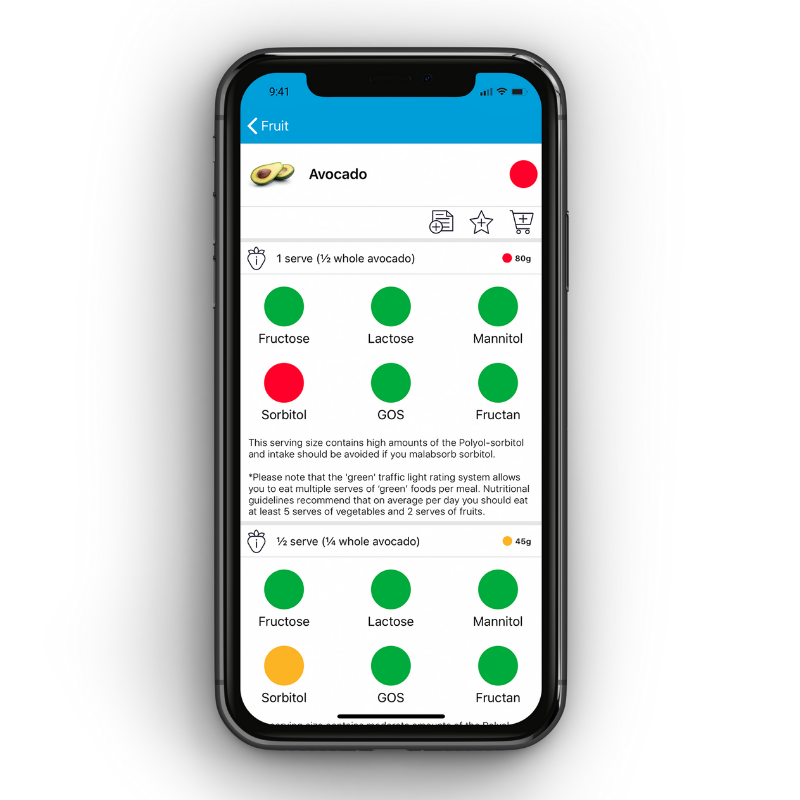 The large traffic light on the right provides you with information about the overall FODMAP rating of a food when eaten in a 'typical' amount. This 'typical' amount is based on the serving size information found on a food when it is tested for FODMAPs (for example, 2 slices is generally the recommended serving size for bread) or more broadly on healthy eating guidelines (for example, 1/2 cup of cooked vegetables is generally considered to be one serving). Please note, the large traffic lights will be hidden when the 'Filter' is activated in the app. If you are using the filters, instead look at the small, red or green traffic lights to see the serve sizes appropriate for you - based on your FODMAP sensitivities. Directly underneath each food, you will also see smaller traffic lights next to specific serving sizes. These traffic lights provide you with a quick guide to how each food's FODMAP rating might change at different serving sizes. For example, in the image below we can see that avocado is high (red) in FODMAPs at the 'standard' serving size of 80g, but that it becomes moderate (amber) in FODMAPs if only 45g is eaten, and low (green) in FODMAPs if only 30g is eaten. The standard serve will always be the first traffic light so foods may start green and go red as serves increase or start red and become green with smaller serves. Please note: you may notice that the small traffic lights change in colour if you have your 'Filters' activated in the app. For more specific information about serving sizes (in cups/household measures) or about which FODMAP(s) are present in a particular food, this is found by clicking into the food. 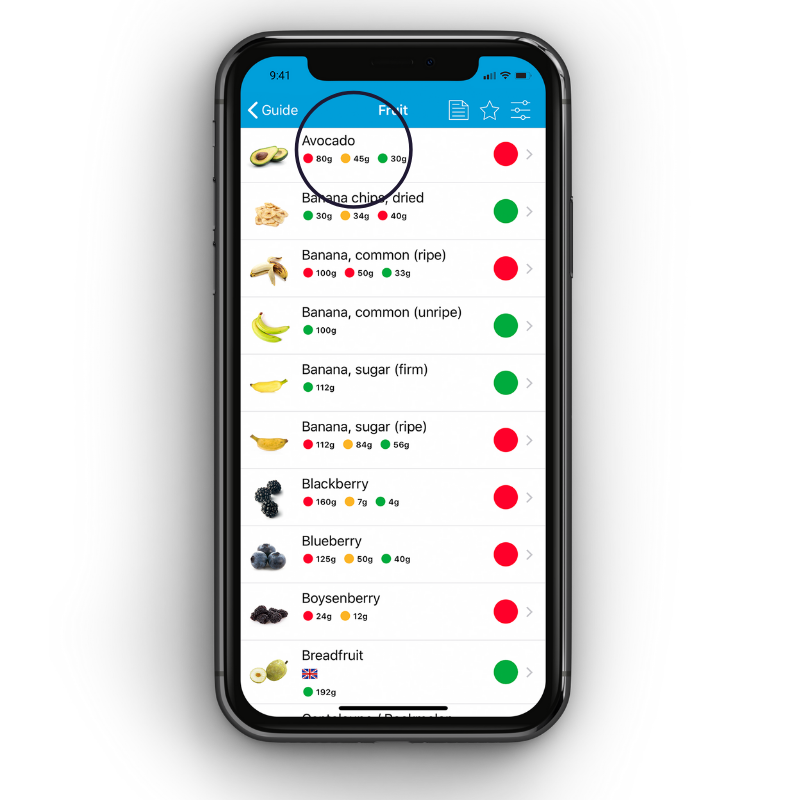 We can see in this example below that avocado is high (red) in FODMAPs in a 'standard' serving size of 80g (or 1/2 whole avocado) and that the particular FODMAP it is high in is sorbitol. How to I use the traffic lights during my 3-step FODMAP diet? During step 1 of the FODMAP diet (low FODMAP diet), we recommend that you choose 'green' serves of foods (low in FODMAPs), limit 'amber' serves and avoid 'red' serves of foods (high in FODMAPs). 'Red' and 'amber' serves of foods are then slowly reintroduced, depending on your level of tolerance, in steps 2 (FODMAP reintroduction) and 3 (FODMAP personalisation) of the diet. We hope that this helps you to better understand how to understand the app's handy traffic light system! 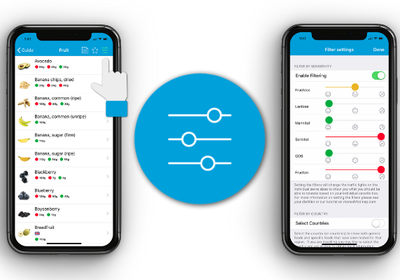 For more information, please speak to your local FODMAP-trained dietitian or click 'start the diet' on your app home screen and complete the 'Step 1: Low FODMAP Diet' app tutorial.